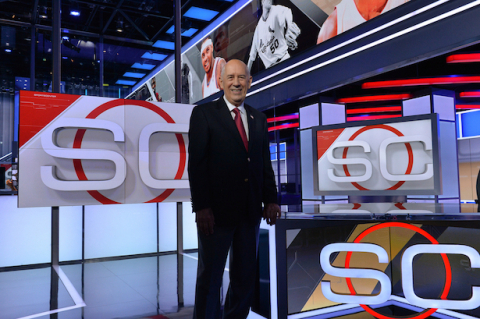 JACKSON, Wyo.--(BUSINESS WIRE)--ESPN Founder Bill Rasmussen has always put his fellow sports fans first with his entrepreneurial ventures. This week, he and his partner, award-winning technologist Hutton Pulitzer, have launched FEVR Tech, a new company with proprietary technology which significantly improves and enhances the fan experience at live sports events in venues of all sizes. “FEVR Tech might be the most powerful social communication tool ever created specifically for fans in live sports venues. We talk WITH fans, not AT fans -- our mantra is simple – Fans Rule,” said Rasmussen, the legendary entrepreneur and innovator who changed how the world watches television and how we all watch sports today. “With FEVR Tech, we have created a new way to enhance the fan experience at the event, and enhance the way teams, venues, leagues and conferences, and partners can communicate directly with the fans at any live sports event,” Rasmussen said. This week, the world’s leading sports business periodical, The Sports Business Journal, featured the launch of FEVR Tech in an article by journalist John Ourand. FEVR Tech (the name derives from an acronym for Fans Engage Vote Respond) combines the entrepreneurial vision, business acumen and sports enthusiasm of Rasmussen, the man who created a new industry of 24-hour cable television with the launch of his brainchild, ESPN, on September 7, 1979, with the technology and patent prowess of Pulitzer, who has created previous intellectual property and a patent portfolio that is present in over 11.9 billion mobile devices (smart phones, cell phones, tablets, etc.) around the world. Pulitzer is one of the world’s leading technology innovators, with patents on applications and systems for Internet communications, Internet commerce, broadcasting and communications. With a history of creating new technology and applications, Pulitzer began working with Rasmussen, and when Rasmussen recognized a new use for key Pulitzer innovations, an estimated 200 patents created a legal “fortress” for the new company, and the idea for FEVR Tech was born. Rasmussen's vision for a 24-hour sports network turned into an idea that became a $50 billion company. Pulitzer took a vision to an idea that is part of every mobile device in the world. FEVR Tech plans to partner with college and professional sports leagues, teams and TV networks to provide its engagement system in venues around the globe. Sports teams and league partners will use FEVR Tech to make fans happy, make sponsors happy and improve the overall live event experience. “It’s really whatever the team wants to do with it,” Rasmussen said. “FEVR Tech engagement creates multiple revenue streams where there have never been opportunities to monetize before, and will make fans appreciate more than ever that live events are the best events. It magnifies the excitement of the live event experience many times over. Additional information about FEVR Tech is available at http://www.FEVRTech.org. FEVR Tech launches, with ESPN Founder Bill Rasmussen and noted technologist Hutton Pulitzer, to enhance fan engagement at live sports events.